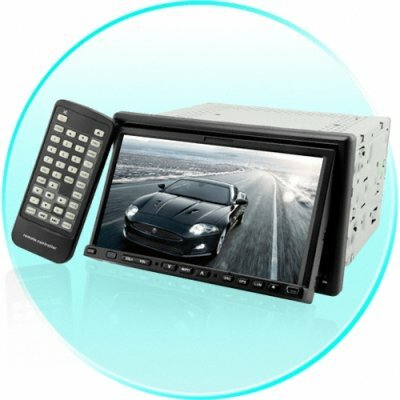 Successfully Added Double DIN 7 Inch Touchscreen LCD - Car Video DVD Player to your Shopping Cart. Double DIN sized car DVD player with 7 inch touchscreen for playing all your digital media and features bluetooth connectivity with your mobile phone for safety while driving. The CVSAW-4502 model has a 7 Inch touch screen with motorized adjustable screen, excellent compatibility with many digital formats and disks, and a built in TV tuner with PAL, NTSC, and SECAM decoding. This touch screen car stereo DVD player has often been refered to in the press as an advanced entertainment system because its list of other impressive features includes all this; CD and DVD player, radio, digital media players (audio and video), bluetooth, front USB port, rear camera viewer, CDC and additional AV/AUX inputs! Offered at a great Chinavasion wholesale price, this 2-DIN car stereo DVD player is perfect for either the resale market, OEM market, or personal/company use. As always, it is only available from your source for wholesale direct from China electronic products, Chinavasion Electronics..